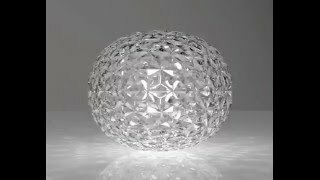 Kartell Planet Low Table Lamp. A complete family of lamps, its special feature is the shape of its slightly elliptical diffuser. Its transparent surface, which is many-sided both inside and out, creates a rich tapestry of reflections. The table lamp comes in three finishes: smoke/black, yellow/gold, transparent/chrome.